I have not had time to post some recent data on the growing chasm between public and private worker pay in the US, but I still plan to do it as this is a theme we've been pounding the table on since blog inception in 07... [Dec 16, 2007: California in a State of Fiscal Emergency - Coming to a Theater Near You] Much like many of its people who have spent far more than they take in, the politicos at the state level act no different than the politicos at the federal level. Spend what you have today, and never assume a rainy day in the future. Since the state and city level budgets cannot be solved by more and more borrowing, there is only one ultimate solution. Full subsidization by the federal government, who not only is running massive deficits of its own - but in the end game, will be the vessel for states to run deficits. [May 5, 2009: Federal Aid Surpasses Sales Tax as Top Revenue Generator for States] We are now officially at that point as some of the states have run out of accounting gimmicks to paper over deficits. I tried to be generous in the title of this specific piece since it's the holiday season, but it really should be something akin to "private workers of country asked for bailout to subsidize early retirement and generous benefit packages for public workers of California." Or "taxpayers in Idaho asked to pay for imbalances in California." In LA alone, pension payment will be sucking up 1 in 3 (yes, you heard that right) of all revenues in half a decade. Leaving the other 2/3rds for minor things like... running the 2nd largest city in the nation. [Aug 11, 2009: LA Times - Amid Cost Cutting, Los Angeles City Pensions Continue to Soar] These are the type of things the nation is being asked to subsidize via these "stimulus plans" and whatever the Governor is asking for now. •"We should never, ever design a pension formula that provides more for a person when they retire than when they are working. It defies any common sense," said Marcia Fritz, vice president of the California Foundation for Fiscal Responsibility, a nonprofit pension reform group headed by former GOP Assemblyman Keith Richman. •"But that's what we're finding" in some school systems and public safety agencies, Fritz said. ...that the share of the city general fund receipts required by two large pension funds would jump from 15% this year to 33% in 2013-14. I am aghast when we hear comments such as "there is nothing left to cut" ... no there is; simply putting public workers pay and benefits at par with what the private worker now gets would immediately cause massive surpluses at the state and municipal level. But this is now the third rail of politics so rather than make such harsh decisions, we now are at the next step of the move to Banana Republic. We've now had 2 stimulus plans (the spring 2009 and the coming "jobs plan" in early 2010) that are blank check handouts to state workers ... and now California is asking for $8B more in direct aid (aka "adjustments") OVER AND ABOVE what has already been transferred to them via "stimulus".. I am not sure when the private sector employees of the country finally say "enough" but let us be sure, until they do - we'll continue down this path. I write this with no offense to readers in the public sector - this is just an untenable situation. It's a ponzi scheme, plain and simple - some form of reality check must happen at the public level; we cannot run 2 parallel America's; one open to global wage arbitrage, evaporated pensions, et al and another completely protected from such realities. 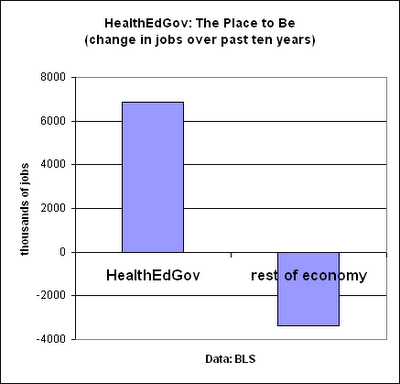 Instead of seeking one-time stimulus money or a bailout, (which the state has ALREADY received earlier in the year via the massive stimulus plan - and will receive AGAIN when the next 'jobs plan' hatches early next year) the most-populous state wants the U.S. to reduce mandates and waive rules stipulating expenditures on programs such as indigent health care, the official said. “The problem is that there are no easy solutions left,” (wrong - there are easy solutions - there are simply none that are popular; any solutions past the previous accounting gimmicks will require actual sacrifice) said Jean Ross, executive director of the California Budget Project, a Sacramento-based research group concentrating on issues facing the poor. Schwarzenegger’s arsenal of one-time accounting maneuvers he and lawmakers have previously used to temporarily paper over parts of the gap -- such as accelerating income-tax collections -- has been mostly depleted, making efforts to erase the latest $21 billion deficit more difficult. The state was the biggest bond issuer this year, selling $36 billion of debt. California is the largest and most obvious black hole, but it's effectively a nationwide problem. If you are in Arizona you might want to head over to Mish Shedlock's site for today's post: 'Arizona Governor Jan Brewer: "We face a state fiscal crisis of unparalleled dimension'. Actually if you are a reader from ANY state you now need to care about Arizona... because you are going to help bail them out... err, provide "stimulus". How is this going to work in the long run? It won't - ask Greece. Eventually there will be no blood left to squeeze from fellow citizens. Think of where the states would be without direct federal aid the past year. California’s general-obligation debt rating from Moody’s Investors Service is Baa1, the company’s eighth-highest investment grade, and A from Standard & Poor’s, the sixth- highest. By comparison, Greece, the poorest member of the 16- nation euro region, is rated two steps higher at A2 by Moody’s and two lower at BBB+ by S&P.